Limited shelf life of bakery products, caused by microbial deterioration, is a concern for industries due to economic losses. Fungal spoilage of sponge cakes industrially produced in Montevideo was caused mainly by Penicillium species, in particular by Penicillium crustosum. The combination of different hurdles was studied to inhibit P. crustosum growth in sponge cakes. A full factorial design was performed to study the effect of the concentration of potassium sorbate, pH, packaging atmosphere and storage time. The results showed that packaging atmosphere and storage time were the significant factors in the ranges tested. No growth was detected in cakes stored in modified atmosphere packaging (MAP) (N2:CO2 50:50) at room temperature (25 °C) for 15 days. 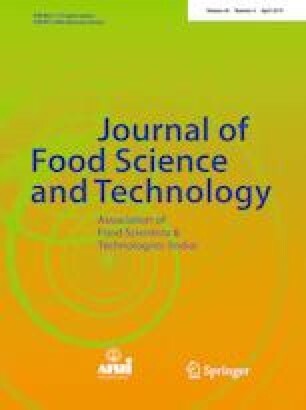 The effect of MAP on P. crustosum growth in cakes at room temperature was compared with the effect of air-packaging and storage at low temperature (4 °C) for 30 days. P. crustosum growth was not detected in cakes packaged in MAP, whereas it was detected after 20 days in cakes packaged in air and stored at 4 °C. This growth was quantified by a specific real time PCR developed in this work. Specific primers were designed using the sequence of β-tubulin gene of P. crustosum as a target and PCR conditions were adjusted to ensure specificity. PCR efficiency was 107%, with a detection limit of 0.0014 ng of DNA. The qPCR method presented here, resulted specific and sensitive enough to detect the growth of P. crustosum even before biodeterioration signs were visible. We thank the Comisión Sectorial de Investigación Científica (CSIC, Uruguay) and the Agencia Nacional de Investigación e Innovación (ANII, Uruguay) for financial aid. We also thank OLASO (Uruguay) for providing cakes samples.